Well this might sound weird, but I am very excited about this treatment for mastitis that I found out about. I'll start from the beginning. . .
A little while after the cow first freshened, she had mastitis in 2 quarters. I treated them with U.S. Vet/Today Penicillin in the teats. It cleared up one, but the other one never really got better. She just constantly had cheesy chunks in it, and her milk was dropping in that quarter. I didn't know what to do as I had treated it a couple of times with the Penicillin treatment. I left it alone for a week and it still didn't get better (nor much worse, except that her production was slowly dropping in that quarter). Well, I read online on a cow forum that I am on that Peppermint oil clears up mastitis really well. It wouldn't hurt to try, right? So we got some Peppermint oil, and I mixed 1 tablespoon Peppermint to 1 cup Coconut oil (any type of "carrier" oil will work - palm, coconut, etc). The first time I only rubbed it on the outside of the quarter, but then learned that I could infuse that teat with it also. So I did 10 cc inside the teat, and then rubbed the entire quarter with it also. Needless to say, it smells great and that quarter is VERY soft! After about 2 days of doing that, there are NO MORE CHUNKS in that teat! And her production is back up in that quarter. Very exciting! I am going to keep treating a few days after there are no more symptoms. 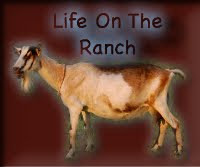 I never heard anything like this for treating mastitis in the goat world - so this is very cool. 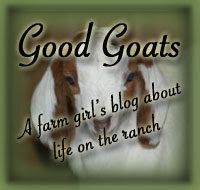 If I ever get a goat with mastitis (never have - never hope to!) I will try this first. Let's see. . . for a couple of days last week I put my 3 yearlings (Maple, Blueberry and Double Bubble) in with our little Nigerian buck, Berry Blast. Double Bubble was in heat one of those days, I just hope he bred her! I saw him trying, but he is so little, even to them! Daisy Mae and Chicci went to their new home last Thursday. So that's it that we had for sale of the dairy does. We now have a 2 1/2 yr old dry Nubian/Boer doe (her sister is a good milker) for sale for $125, a big 7-8 month old Nubian/Fainter/Boer buckling available for $65, and a Paint Boer buck for sale for $90. We have someone coming to look at the paint buck tomorrow, so he probably is not available anymore. These are all nice goats. None of them are registered. Email or call me if you are interested (sf@goodgoats.net - 918-598-4004). Today I cleaned the milking parlor - scrubbed the milk stanchion, took the spider webs down, put new fly-strips up, cleaned the shelves, sprayed lots of the room with cleaner, and thoroughly swept the room. Much better. Still some cleaning to do. Not much else to update on at the moment. It's time for me to go to bed! It's fall already. . . time flies by! Doesn't really seem like fall yet, except for today it was cool all day, so it is getting there! All of the does that we had for sale at the moment, are sold. We are also selling our Boer buck and probably a Boer/Nubian doe on Sunday. It's nice to move some stock out every now and then. My brother is also really hoping to be able to buy this very nice typed and pedigreed 2 year old Boer buck from a breeder in the OK City area. If everything goes as planned, we'll be getting him in early October. . .
And since he'll be coming, we need to add on to the buck shed, as there will be no room for him. Right now it's only an 8X8 and barely fits all of them in there, and when it's raining - let's just say it's hard to be able to feed them all in there. So, hopefully tomorrow we are going to drill 5 more holes for posts, and we will make it a 16X16X16, with probably 8 ft of one side open. That way they can all fit nicely in there, and we can build a hay feeder for winter. There will also be a 8 ft long middle wall (the wall of the buck shed now) in it, so that way if there are bucks that don't care for each other, they can sleep without seeing each other :). Speaking of building things - we are also planning on building a big hay feeder for inside the doe barn, a patio outback, fix a loafing shed, and maybe a couple other sheds, plus much more BEFORE winter comes! The pictures are ones that my little sister took sometime ;). flowers in fall? Oklahoma is weird! Well, I have not posted as much lately. It STILL has been raining a lot, and is very muddy outside. Now it's time for some sunshine! Yesterday, the 17th, I bred Adams Funny Farm Daisy Mae to Dreamy-Hollow Lando. So she'll be due February 14th. SO we now have 8 does bred. Everyone seems to be coming into heat a little slower this year for some reason, but that's not a big deal - just means kidding time will be a little more spaced out. I don't have much to say today :). Have a great weekend! 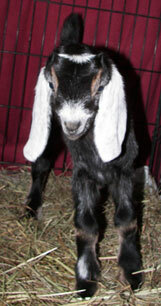 I still have 4 Mini Nubian does and yearlings for sale. They are very nice does also. I am willing to drop the price on them as I really could use to move a few on. 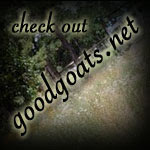 Email or call me if you are interested - sf@goodgoats.net - 918-598-4004. Today I had a good time riding with one of my brothers and my cousin. Learning a lot! It takes a lot of practice to be good at riding. Hopefully I'll be ready by the time it's time to start my horse, Tank, in a few months. I also bred another Nubian doe today, "Grandma" Maggie. I bred her to Junior Mint. She's due February 8th. Here are some photos that I took yesterday. Susie Gibbs of Martha's Vineyard Fiber Farm in New York, is offering a small starter herd of Angora goats free (you pay transport) plus a free run-in shed from Sand Creek ost and Beam. To win this package and GREAT giveaway, you need to write an essay about why you want them. All of the info is on her blog, click here. I would do it myself, but don't really need a herd of Angoras, plus transport would be too much for me at the moment! It's a new week in the Photo Contest . . . so go and vote for Canuck! If you can, please vote everyday and maybe we can win this week! Pass it on to your family and friends. Well, it's been raining everyday and the weather is pretty nice. Ever since we built the barn floor up with dirt, the does like it SO much! Whenever they are not out to pasture, they just lay in their barn! I don't know why they like it so much, but no matter if it is raining or not, cold or hot, they are in there. Weird-does. We got 30 bales of really nice bermuda grass small hay bales. The goats like it a lot and it was only $5 delivered. Very nice. Not too much to update on. We will be leaving in a bit to go out to lunch with some friends. Here are some photos of most of the bucks taken a few weeks ago. I guess this answered my question about whether to put sand, gravel, dirt, etc in the barn! This morning it started raining, a lot, and it still is raining and is suppose to rain for the next 10 days... fun. I guess it's good for the grass to grow though :). BUT, this caused a big problem. When we cleaned out the barn, it made the barn a little lower than the ground above it (the ground is sort of slanted there anyway). So a few hours of raining and 3/4 of the barn was squishy/mud or had 6 inches of water in it. . . something had to be done then otherwise the milkers could not come back from being milked since it was soo muddy. So out in the rain we go, with the tractor and some rakes. My brother got dirt from a place on the property and dumped it in the barn while we leveled it out. It actually turned out really nice and got the job done (that was going to be done anyway), done a lot faster! It only took us about 1 1/2 hours. . . not too bad. But I was covered in a lot of mud :). Now just when it gets cold, we can throw some straw in there. It is surprisingly cold for September. . . I kind of hope it warms back up otherwise we are going to have cold weather for a long time! For an update on the cow - she is doing a whole lot better. The teats that we treated for mastitis are doing great and show hardly any mastitis in the tests. Her production seems to be going up. Last night she gave 4 gallons, this morning 2 1/2. It's still a little weird, fluctuating all of the time. I think she should level out soon though. The machine is working and emptying her udder well. The only "ugly" spot is where she got that cut. It's very dry and hard, not really the udder, as it has kind of "separated" itself. But we started putting cream on it and maybe it'll get soft and heal a little nicer. We still have 4 does for sale, if anyone is interested.